The countdown for ' I Saloni ' has begun! And you, are you ready? At less than a month to go for the most awaited event in furniture design, Arredoclassic reveals its latest news. During the occasion of the 53rd edition of the International Furniture Fair, we present a preview of two unedited Collections: Melody and Leonardo. Inspired by the harmonious balance of music, Melody is told in elegant curved lines and delicate white-mélange colors, recalling a carved stone finish. 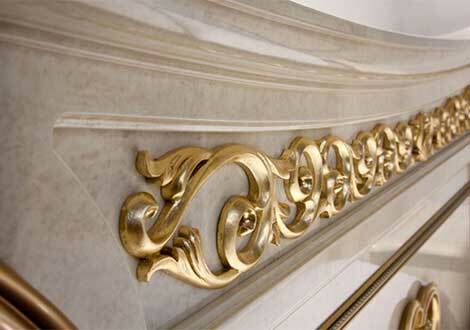 The design theme of the golden column extends to the furnishings and surrounds them, just as in a romantic embrace. Leonardo reinterprets some historical creations of the brand, fusing them into a new synthesis between classical and functionality. Geometric profiles and stylized frames are drawn by a neat, harmonic line on smooth surfaces with light wood and pastel shades. All this and much more awaits you in a completely new and even more prestigious stand.